In the past three years, I have had the opportunity to go to three live tapings of Wait Wait… Don’t Tell Me!, one in Seattle and two in Portland, my fair city. Since, I can never go to too many Wait Wait live tapings, I knew I had to head back up to Seattle when they announced that they were coming back to do two shows. As I was trying to find a way to make sure that I could queue up to purchase tickets the moment they went on sale to the general public, the awesome gang at Wait Wait said that they would hook me up with tickets to both shows. To say that I was ecstatic would be a significant understatement. At that point, I immediately booked my hotel room and submitted my request for time off from work and started the two month wait. Fast forward to this past week, I made the trek up to Seattle, made a quick stop to drop my stuff off at the hotel and moseyed my way down to the Moore Theatre. After picking up my tickets, I anxiously waited for the doors to open down to the main floor. While waiting, I pulled out my not-so-little steno and started prepping it to take notes during the taping. At that time, I only knew that Luke Burbank would be on the panel and that Greta Gerwig would be the Not My Job guest. Once the doors opened, I made my way down to my seat, which was a pretty darn good aisle seat in the center section and found out that Negin Farsad and Hari Kondabolu would be two other panelists. 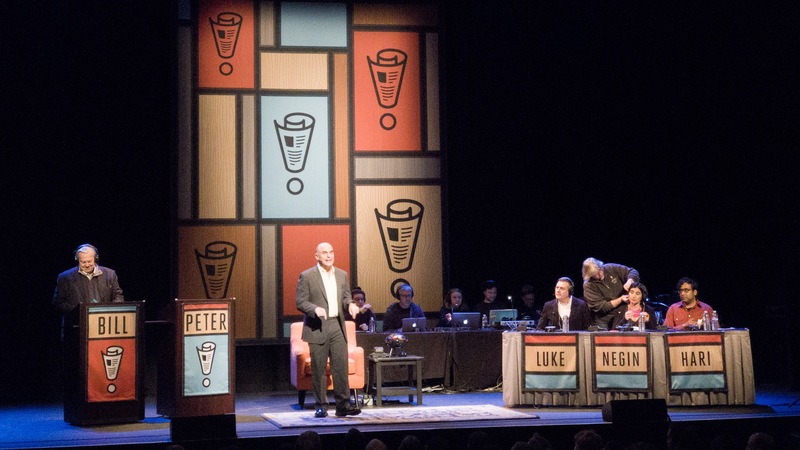 Back in August 12, 2006 when Luke filled in for Peter Sagal for three shows, the tradition of the audience chanting “Luuuuuuke!” started when he is introduced or mentioned during the taping. The tradition continues today, though varies depending on the size of the crowd and the location of the taping. Since this show was taped in Luke’s home turf of Seattle, it was quite pronounced. Of course, there are always a portion of the audience that think people are booing Luke rather than chanting his name. Overall, the show had a lot of funny moments created by the various jokes that Peter and/or the panelists make regarding the questions that were asked to the listener contestants and to the Not My Job guest. For the Lightning Fill-in-the-Blank round, Hari ended up getting the short straw when it came to the starting order; as, the questions that he was asked were some of the more tough questions out of the pool asked. Hari was only able to correctly answer one of the eight questions. More on this later on. Normally, if there are any pickups, bits that need to be re-done due to slip-ups or technical issues, those are done after the main portion of the taping has finished. There was one pick-up that had to be done before the Who’s Bill This Time? listener contestant disconnected as his response of “tax scam” needed to be re-done with a more neutral response of “tax plan”. Once the taping of the show was completed, Peter segued over to the Q&A portion of the show. When he asked if the audience had any questions, I immediately shot up my hand; which, Peter was easily able to see, partly because I was wearing a bright blue jacket. Peter pointed to me and, before I could ask my question, recognized me and told the audience who I was and that I run the Stats Page. Afterwards, I was able to ask my question, which was if they had anything planned for the 20th anniversary of the show in 2018. While I did know about one small project that is being planned, but they haven’t formalized anything official yet. After the audience Q&A was done, I got to talk to Luke and meet some of his family (some I haven’t met before) and was invited to join the after-show reception held by KUOW. As I was walking to the reception, I got to meet and talk to Negin, Bill Kurtis and some of the producers and behind-the-scenes people. I’m always humbled when I hear that they refer to the Stats Page quite often to get information about past shows, panelists and guests. Down at the reception, quite a number of people come by asked questions about the Stats Page and how I started the project. Then, it was time to head back to hotel to try to get some more rest. 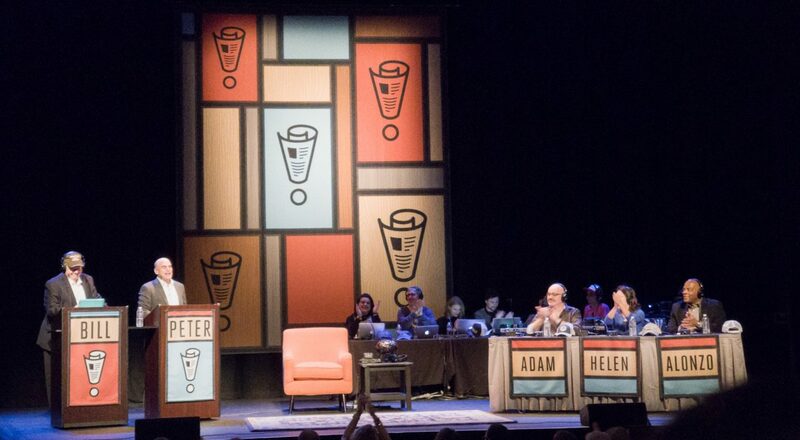 In more recent times, when Wait Wait tapes two different shows in a single city, the second show has a new panel, a new Bluff the Listener topic, a new Not My Job guest, and a new set of listener contestants. For the second show, the three panelists were Adam Felber, Helen Hong and Alonzo Bodden; and, the Not My Job guest was Lindy West. Although a good portion of the questions from the first show are re-used for the second show, that isn’t a real issue; as, the only two segments that usually get aired on a future “Best Of” show are: Bluff the Listener and Not My Job. Even if someone does end up going to both shows, including yours truly, using the same questions again doesn’t mean you’ll get the same responses and/or reactions from the panelists. Since a large portion of the show will not be aired, it allows Peter, Bill and the panelists to get a lot more blue. Now, usual standard for the show is that the listener contestants will participate on the show over the phone (with the exception of the Not My Job guest, who don’t get to participate directly); but, due to technical difficulties with the phone systems, they had to improvise and select three audience members to be contestants for the Who’s Bill This Time?, Bluff the Listener and the Listener Limerick Challenge segments. As alluded to earlier, the Lightning Fill-in-the-Blank questions were reused from the first show and each set of assigned questions were asked in the same order (first set for the first panelist, second set for the second panelist, third set for the third panelist). This meant that the same, more difficult questions that Hari got asked was given to Alonzo. Although Alonzo did fair a little bit better than Hari; but, in the process of trying to figure out the correct answer, the audience kept shouting out answers (most were correct). Peter kept on hinting, winking, nudging, or telling the audience to not shout out the answers. While, the Q&A portion of the first show went smoothly, it was all but smooth for the second show. There were several people shouting out questions at the same time, some could barely be heard or were cut in by others. I’m not sure why it was as chaotic as it was; but, it was the first time that I saw Peter get a bit frustrated with what was going on. One of the questions that the audience asked Peter and that lead to Peter to talk about the Defenestration of Prague; in which, Adam said it should be called “Defenestration in Prague”. With that, Peter responded to Adam’s correction and the discussion with “This is NPR”. That is when the producers and editors decided to throw balled up paper at Peter. Once all of that was done, I slowly made my way to the stage as people were exiting the theatre. I got to talk to Adam Felber and, meet the Benevolent Overlord, Doug Berman, himself. Doug invited me to the after-show reception being held by KNKX. Even without a shout-out from Peter during the Q&A session of the second show, there were still a number of people that knew of me and wanted a chance to meet me. I also got to meet and talk to Helen Hong for the first time. I mingled for a little while longer before needing to sneak out and head back to hotel. 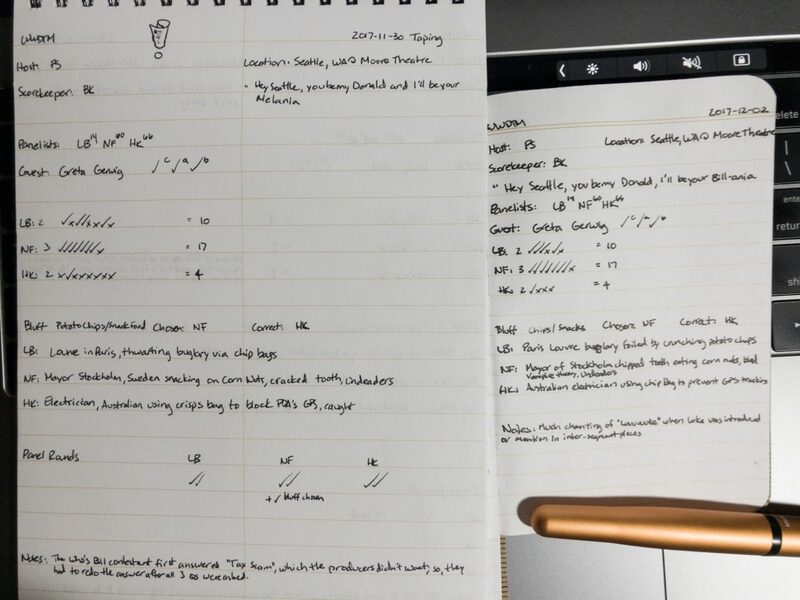 When I got home on Saturday, I listened to the show via the NPR website and took notes in my normal Wait Wait notebook and wanted to see how much was edited out. As usual, several of the panel questions were not aired and the ones that did make it were edited down due to time or content constraints. For the Lightning Fill-in-the-Blank round, they did keep in all of the correctly answered questions and edited out several of the questions that the panelists did not answer correctly. I absolutely had a blast at both shows and was humbled to have been given a shout-out by Peter at Thursday’s show. It was great to be among and get to chat with other Wait Wait… Don’t Tell Me! fans at both shows. Many, many thanks to the Wait Wait gang for the tickets to the shows and for all of the hard work they put in to make such a great show.